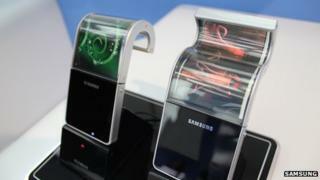 Researchers are working on just such handsets - razor-thin, paper-like and bendable. There have already been prototypes, attracting crowds at gadget shows. But rumours abound that next year will see the launch of the first bendy phone. Numerous companies are working on the technology - LG, Philips, Sharp, Sony and Nokia among them - although reports suggest that South Korean phone manufacturer Samsung will be the first to deliver. Samsung favours smartphones with so-called flexible OLED (Organic Light Emitting Diode) technology, and is confident that they will be "very popular among consumers worldwide". There are other technologies that could make your smartphone bendy. After all, the concept - creating flexible electronics and assembling them on equally flexible plastic - has been touted since the 1960s, when the first flexible solar cell arrays appeared. In 2005, Philips demonstrated the first prototype of a rollable display. Amazon's first Kindle e-reader used a plastic non-rigid screen - known as an optical frontplane - to display its images. The only problem was that the components beneath it required the device to be stiff. LCD (Liquid Crystal Display): consumes a lot of energy, as every pixel on the screen is illuminated by a backlight. OLED (Organic Light Emitting Diode): each diode is its own light source, switched on when it receives an electric signal. Devices can be slimmer than LCD, better at reproducing colour, use less power, and flexible. E-ink: reflects ambient light from the surface of the display back to your eyes. It has longer battery life than other displays, but is usually black and white. It could be made in colour by placing a filter with red, green and blue tints on top of the original black-and-white display, but the colour is less bright than on OLED and LCD screens. "They [are] well-suited for simple phones, memory and battery indicators, smart credit cards, wristwatches, and signs." One reason is cost, says Abhigyan Sengupta, an analyst with consultancy firm MarketsAndMarkets, which recently published a global study on flexible displays. Although Mr Peruvemba says his firm has started manufacturing displays with flexible backplanes in-house, its many partners are also busy researching ways to make electronic paper as flexible as the real thing. Another company working with E-Ink is UK firm Plastic Logic. It uses the US firm's optical frontplane but adds on its own backplane made out of non-rigid plastics, and then sells the part to device-makers. Last May, Plastic Logic demonstrated a paper-like flexible screen capable of playing video in colour, which is achieved by placing a filter on top of the original black-and-white display. But the colours are not as bright as on other types of screens, and the company's research manager Michael Banach acknowledges the technology at the moment is most likely to be used as a back-up screen which kicks in when batteries run low, rather than the main display. Clad in blue lab overalls, Prof Andrea Ferrari from Cambridge University works on future bendy displays using graphene. Graphene is a sheet of carbon just one atom thick - yet it is stronger than diamond, transparent, lightweight, has great conducting properties - and is flexible. "Samsung is really quite advanced in this field, but we here in Cambridge have done some great work on Nokia's prototypes as well." He says that graphene will complement and highly enhance the performance of OLED-type flexible phones, because in theory, even a handset's flexible battery can be made out of this material.